This table is a contemporary work of art .. This custom king size bed frame is truly fit for royalty. Incredible presence standing 10' tall to the center of the canopy. The detail and beauty can not be captured in photo or word. The massive twisted corner posts with beautifully detailed foot and finial, a romantic arched canopy, and beautiful solid 1/2" curvy scrolls with fleur de lis set in the center of the headboard and footboard is stunning . This is a true heirloom worthy of being treasured, and passed down through generations! .. 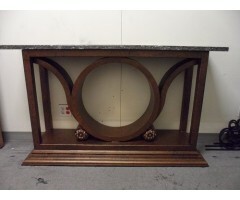 Using a 1" solid square bar twisted and embellished into a custom table base is quite impressive holding the 6' long x 4' wide x 2 3/4" thick Granite top! .. Precise measurments, careful design layout of several elements went into this work of art. 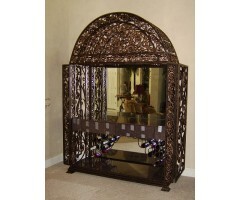 It is a conversational showpiece reflecting shadows and light in the most incredible form. .. This bed is a variation of FR/AC-003 (see description) without the canopy, smaller guage twisted posts, feet and finials, and a different design on the footboard. .. 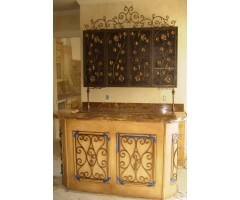 This beautiful custom panel was designed per the customer's request. .. This elegant tapestry hanger was bent slightly to the fit the curvature of the wall. .. 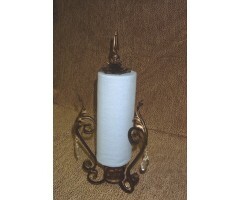 These beautiful custom fit tapestry hangers also work nicely as window treatments. .. This grand bench is perfect against the home's stone entryway .. Custom insets for this wine cabinet are in the process of being installed, and a beautiful back board wine glass holder was designed using grape vines and leaves on a sold back and a scrolled crown top piece. 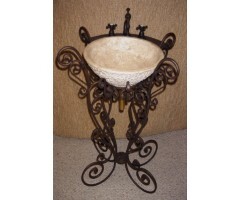 ..
A beautiful bronze finish was used on this custom scrolled artistic sink base. .. Complete with scrolled leaves, finial, and crystal prisms - a beautiful way to keep a roll of paper towels out on the counter with style. ..